I may be cheap, but I am for sale. That's what I learned after unfolding one of those check mailers the other day. My village, Freeport, respected Governor Cuomo's tax cap. We raised the school budget by two percent, or whatever the limit is. Therefore, I supposed, every home owner in my town got a similar check. I guess we could all jump up and conclude, "Wow, that Andrew Cuomo is one heckuva guy. He just gave me money, and I like money." And yet he's the first guy who got me to stop voting blindly for Democrats, as he ran for the first time on a platform of going after unions. I actually think, if he'd been fairer with unions, that I'd have more than just 240 bucks, so I'm not all that happy. So what to do? Do I sent the 240 bucks back? I don't think that would be an effective form of protest. For one thing, it would just seep back into his Evil Empire. He'd probably find a way to funnel it to Eva Moskowitz, and she'd use it to bus hapless children to Albany. That's not gonna work. Should I go all consumer and put it back into the economy? Shop local? Maybe I could get all my shoes fixed at the shoe repair shop that's miraculously survived. But my shoes aren't broken, so what's the point in that? What I really wonder is whether these checks will help soften the loathing and disgust with which people view Andrew Cuomo. He's already being touted as a 2020 Presidential candidate. Personally, I'd hope the Democrats would go with someone who actually favors working people, as opposed to a union-basher. Isn't that the Republicans' job? Shouldn't they sue him for pretending to be a Republican? Should we sue him for pretending to be a Democrat? Actually, Cuomo is neither a Republican nor a Democrat. Like Michael Bloomberg before him, he's a raving opportunist, doing and saying absolutely anything he thinks will promote his endless and bottomless ambition. That doesn't sound like a winning formula, but given Donald Trump is President-elect, it might just be the ticket. With the "ethics-shmethics" philosophy of the incoming Trump administration, I see it as unlikely they will do a big push to end corruption. Of course, the Donald could view Cuomo as a rival and therefore go after him to preclude competition, but somehow I'm pessimistic over the possibility of his sharing that cell with his buddies Skelos and Silver. 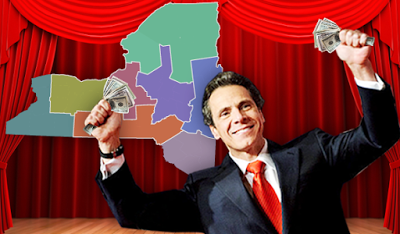 What do you think the appropriate disposition of 240 Cuomo bucks would be?